Spray a large roasting pan with non-stick vegetable spray and set aside. Place 2 Tbsp (30 mL) vegetable oil in a large bowl. Place the chopped onion, carrot, sweet potato, white potato, parsnip and tomato in the bowl and lightly toss the vegetables, just enough to cover with the oil. Transfer the vegetables to the roasting pan and lightly season with salt and pepper. Place in the oven and bake until the vegetables are tender when pierced with a sharp knife, approximately 45 minutes, turning the vegetables occasionally. Remove the pan from the oven and set aside. Meanwhile, heat the remaining 2 Tbsp (30 mL) of vegetable oil in a large stock pot over medium-high heat. When hot, add the leek and cook until softened, approximately 3 minutes. Add the red pepper and sauté for 1 minute. Stir in the garlic and sauté for 30. Toss in the basil, oregano, soy sauce, Worcestershire sauce and sprinkle the flour on top. Stir until the mixture is well combined. Gradually stir in the Lactantia cream. Stir the beer in slowly to prevent lumps from forming, then the chicken stock. Bring the mixture to a boil, reduce the heat and simmer for 10 minutes. Add the roasted vegetables to the stock mixture, along with the corn. Bring the mixture to a boil, reduce the heat to simmer and continue to cook the 20 minutes longer. Remove from the heat. 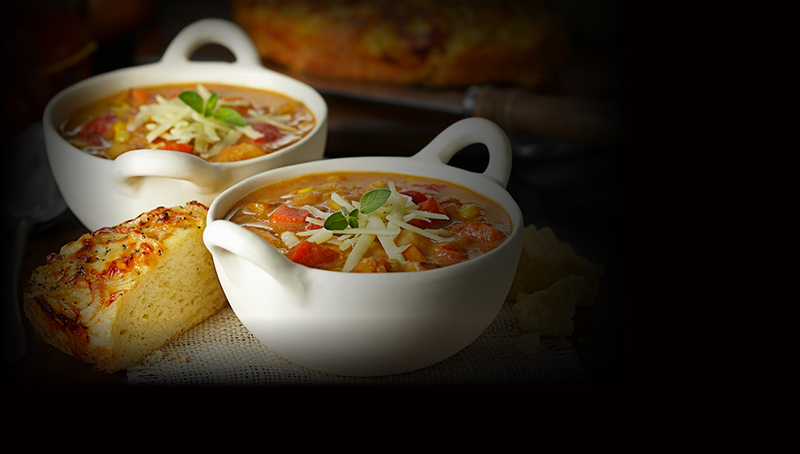 Add the Balderson Cheddar cheese to the soup and heat the soup through, stirring frequently until the Balderson Cheddar cheese is melted. Ladle into bowls and garnish each with a little more grated Balderson Cheddar cheese or a fresh herb sprig such as parsley.